Pretty Lady with Pink Hat and Dress Brooch. Gorgeous silvertone brooch of lady with pink dress and hat. 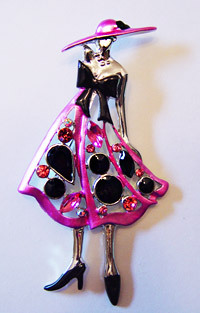 Pretty black jewels and pink rhinestones accent this pin. Measures approx. 3-1/4 inches long x 1-3/4 inches wide at bottom of skirt. Brooch style pin on back.